Hello and welcome to my web site. My name is Bill Bath and I am the Gadget Engineer. I am a Mechanical Engineer living in Houston, Texas and for more than 40 years I have been designing and inventing new machines. Most of these machines have been related to the offshore oil business and to nuclear waste clean-up, but the kind of machines I like the best are classic British motorcycles and robots. 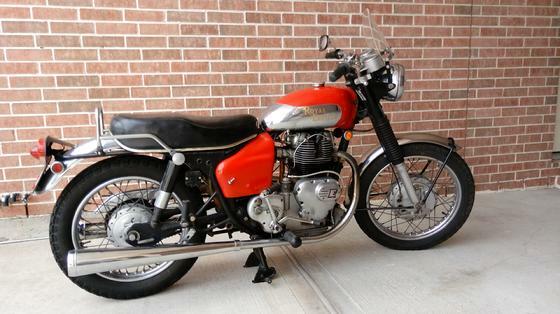 My 1969 ROYAL ENFIELD INTERCEPTER was pruchased by a gentleman in England. I like to think it is going home! I bought this 1969 750cc Royal Enfield Series 2 Interceptor brand new in the summer of 1969 just a month before I got out of the Air Force. I had been stationed at Ramstein Air Base in Germany for 3 years and was ready to return to the states. Before I did, I went to London and bought this bike. I picked it up at Eleat Motors, Tooting Broadway and rode it around Southern England for a week before having it crated up and shipped by boat to Houston. When it arrived, I drove down from Lubbock, where I was attending Texas Tech University. I rented a trailer, brought it home, and I have been riding it ever since. The 750 Interceptor was a super bike of its day. With a top speed of around 115 mph it could easily outrun most British bikes that struggled to top the ton (100 mph). Its long stroke engine gives it bags of torque and it will pull smoothly from 40 mph to highway speeds in 4th gear with no need to downshift. Of course, dropping down to 3rd and winding on the throttle provides a most soul-satisfying experience. For most of its life this Interceptor has been my only bike and I have spent a lot of time upgrading and improving it. Following is a description of some of my improvements. However, I want to point out that all of these modifications are completely reversible and the bike could be restored to original condition at any time. Mikuni carburetors: I bought these 34mm carbs at a swap meet and spent a lot of time trying different jets until I decided to get a little more scientific. I used an automotive fuel/air ratio gauge and an O2 sensor to get the mixture just right. This bike now has a reliable idle and pulls smartly in every gear. I have heard that some Amal engineers designed the Mikuni carbs but in any case they are a vast improvement over the stock Amals. I made up a set of custom cables to connect the Mikunis to the Enfield twist grip and handlebar choke lever. Air Cleaner: The straight velocity stacks on the original Amal carburetors look great but there is no air cleaner in the world that will adequately work with them and fit in the space available. I tried several kinds and replaced several sets of worn pistons before I finally gave up and built my own air cleaner. I made a custom fiberglass housing with two large radius nozzles to connect to the carbs. Then I mounted a small flat automotive air cleaner element inside the housing and fitted the whole thing in place of the original battery cover. I am now using a computer back-up battery for the electronic ignition and it is mounted in a box under the seat. Suzuki clutch: The original Enfield clutch can be made to function properly but it has to be carefully adjusted and maintained so that it does not drag when disengaged. The design is such that there are three screws on the clutch pressure plate that have to be set just right so that the plate lifts off squarely, otherwise the clutch will drag and the transmission will be very hard to shift. It turns out that a 450 Suzuki clutch is about the same size as the Enfield clutch. It’s an easy matter to remove the clutch basket from the Enfield chain wheel and rivet the Suzuki basket in its place. I had a couple of adaptors made so that I could mount a standard ball bearing in the chain wheel and do away with the horribly thin plain bearing in the Enfield clutch. Right away I noticed that the friction material on the Suzuki clutch plates was a lot thinner than on the Enfield plates. This meant that the handlebar lever did not have to move as far to release the clutch. I repositioned the pivot point on the handle and I now have a very light lever pull and very good control. The Suzuki clutch and the ball bearing in the chain wheel provide a virtually drag free clutch and now the transmission shifts easily every time. 22T Countershaft Sprocket: When Enfield Precision Engineers designed the Series 2 they made several good improvements, but one (in my opinion) was not so good. They used a 20 tooth countershaft sprocket which lowered the overall gear ratio to 4.44. This ratio provided great (for the period) quarter mile performance but made the engine loaf at highway speeds, which produced annoying vibration. The 22T sprocket increases the gear ratio to 4.04:1. This is the same ratio 3650 rpm with smoother running and less vibration. This also makes dropping down one notch to 3rd gear really excellent for passing. Instrument Panel: Classic British bikes had speedometer, an ammeter, and sometimes a tachometer. Of these, the most useless and unreliable is the ammeter. It is supposed to show if the alternator is charging but it does not give any useful information about the condition of the electrical system. For this reason, I built a small instrument panel to provide a space for a volt meter. This way I know the condition of the battery before starting and the voltage coming from the alternator when it is running. When the needle fell off the last speedometer, I installed an electronic tachometer. I use this and a little chart of speed vs rpm to know (at last) exactly how fast I’m going. I also installed an oil pressure gauge so I know what is going on with that system too. Side Covers and Other Fiberglass: I always liked the look of the side covers on the old Constellations, so I built a pair of fiberglass covers for this bike. The covers are easily removed with a single-lever screw and provide a space for carrying a tool roll. They also match up with the cafe racer tank and seat that I also built for this bike. I also built custom rear-set pegs and controls and adapted a Crusader fly-screen for the cafe racer style I tried for a while before changing back to classic style. Chrome Gas Tank: The custom paint on the tank is designed to hide the Bondo filled dent (on both sides, but I am not really certain of that anymore). Shortly after getting the bike back to Texas, in 1969, I was jumping some hills and I got a little too heavy on the gas. The bike was sideways when I came off the top of the hill so it was crossed-up when it landed. The front wheel dug into the dirt. the cast fork stop on the frame broke off, and the fork dented into the front of the tank. The tank didn’t leak so I filled in the dent and painted over it. This lead to my first modification on the bike. I built a better fork stop. Seat and Rear Fender Assembly: The Enfield seat and rear fender assembly is held in place by the bolts that secure the tops of the rear shocks. The coils and all the electric parts on under the seat so to access them the seat assembly must be removed. To do this, it takes a wrench, stuck up on the back-side, between the fender and the frame, to hold the nut, and another wrench on the outside to turn the bolt. I always hated this arrangement and I admired the Norton Commando method, that has 2 hand-turnable knobs to do essentially the same task. So, one day, I welded some coupling nuts to a couple of carefully shaped plates and bolted them inside the seat frame. I mounted a pair of Norton knobs on some all-thread rods and now the seat can be easily removed without any tools. Pulsation Dampener: One of the unique features of Royal Enfield’s is the very clever double-acting, disk-valve, piston oil pump. The crankshaft for this piston is mounted in the timing cover and driven by a 90 degree worm gear on the engine crankshaft. The cylinder for the oil pump piston is a thick disk that oscillates back and forth as the angle of the piston changes with rotation of the crankshaft. As the disk oscillates, holes in the disk align with ports in the timing cover that are connected to the oil tank and the engine. The suction is thereby opened when the piston is going down and closed as the piston is going up. The engine pressure port is opened and closed in the same manner as the disk oscillates back and forth. This combined action produces a pulsating flow of pressure to the engine. The piston and disc are mounted in tight fitting housing so that when the piston is moving up to push oil into the engine, it is also sucking oil into the housing to provide the double action. The piston is both sucking and pumping on every stroke. In any case, the action of a piston pump can be improved by connecting a pulsation dampener (or Wind Kettle as some Europeans call it) to the system. The dampener is simply an air filled chamber in the oil passage. The air in the chamber is alternately compressed and expanded with the pulsations of the pump. My dampener is mounted inside the timing cover. The chamber is formed by a curved piece of aluminum that is fitted between two ribs in the cover and seal welded into place. A simple drilled hole into one of the oil passages in the cover provides the necessary connection between the chamber and the pump. Center Stand: The standard Enfield center stand is an aluminum casting with a wide footprint and a beautiful design. Unfortunately, it is a little too long and the pivot tube is weak. The length makes it difficult to use because the back wheel must be lifted quite high off the ground in order for the center stand to go over center and lock into place. The other problem is that if you sit on the bike while it’s on the stand, the load on the pivot tube is such that the tube will crack and then the stand is useless. I solved this problem by fabricating a steel, roll-on center stand in the style of a Ducati I once owned. This feature plus the chrome grab rail behind the seat makes it extremely easy to put the bike on the stand. Crankcase: The crankcase currently in the bike is not original. However, I have saved the original crankcase so that the bike can be put back to stock condition if desired. I cracked the drive-side case many years ago when I used to take this bike out to the trails to jump hills and slide sideways. The Series II Interceptor was billed as a “Street Scrambler” and for a long time I used it just like that. The engine is a true wet sump design so the crack in the crankcase allowed some continuous leakage. The crack was welded up but I was never able to make the crankcase oil tight. The crankcase currently in the bike was sealed with Yamabond during the last rebuild and it seems to be oil tight. I enjoy going to classic motorcycle rallies and my Motorcycle Stories page describes some of the best events along with pictures of the bikes. These stories include rallies in Texas, Daytona, Mid-Ohio, and England. My Robots page is dedicated to robot events and my current project the “Lawnbot” robot lawn mower. I hope you will enjoy my story of the Battle Bots in Las Vegas. I think that home-built motorcycles that combine existing components into new and unusual machines should have special recognition so I have created a Motorcycle Specials Page to showoff the best ones that I have seen. Finally I have listed the patents that I have been awarded and the technical papers and magazine articles that I have written on my Professional Recognition page. The information on this page is presented simply to provide some background into my engineering experience. I hope that you will find something of interest in these pages. If you are working on an interesting motorcycle or robot project and need a “reality check” or a bit of mechanical advice then send an email bill@gadgetengineer.com and maybe I can help. Be sure to include a description of your project and some indication of your experience level. If you have a “Special” bike and would like to display it on my Motorcycle Specials page please email some photographs and a little history or description of your Special to bill@gadgetengineer.com . I’ll be happy to add it to the page. If you see a picture of your bike on this page and want to add some history or information please let me know. If you don’t want your bike’s picture here then let me know that too.